Enhance your home with the Seville Classics Baker's Rack for Kitchens. 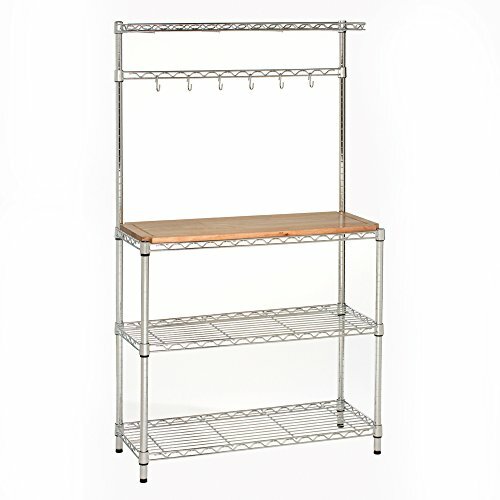 Our bakers rack is constructed with industrial-strength steel wire and UltraZinc plating for strength and longevity. Prepare meals on solid rubberwood removable table top. Top measures .75 inches thick and can be used as a cutting board as well as a place to store commonly used kitchen appliances. Rack features three height-adjustable shelves on the bottom that can be adjusted at 1-inch increments. Each shelf can hold up to 350 lbs. evenly distributed, making them perfect for storing heavy and bulky items. A cantilevered top shelf (36" x 8") provides even more room for storage or decoration. Six S-hook hangers provide a convenient way to store towels, bags, pots, and pans. Keep fresh herbs and kitchen plants in arms reach when cooking. Assembly is easy for one person. No tools required. Dimensions measure 14" D x 36" W x 63" H.
Seville Classics products are backed by a 10-year limited warranty unless otherwise specified. The warranty protects against original defects in material or workmanship under normal home or office use for the duration of the warranty period. Seville Classics products are backed by a 10-year limited warranty unless otherwise specified. The warranty protects against original defects in material or workmanship under normal home or office use for the duration of the warranty period. Removable .75" thick solid rubberwood top; perfect for meal prep, use as a cutting board, or as a kitchen appliance shelf for microwaves, toasters, ovens, blenders and more!